The high-profile bid by New Jersey's largest teachers' union to unseat Senate President Stephen Sweeney in November's election has intensified, as political groups aligned with each side have already spent nearly $1 million on television advertisements. No matter that it's early August, well before most campaigns begin hitting the airwaves to try to persuade voters in state legislative races. New Jerseyans for a Better Tomorrow, a super PAC that supports Sweeney (D., Gloucester), has spent about $600,000 on broadcast and cable ads since July, while the political group founded by the New Jersey Education Association has spent about $300,000, according to a media-buying firm and another source. Unsurprisingly, the villain in the dueling ad campaigns is Gov. Christie, a Republican whose 15 percent approval rating is politically radioactive. "This is an extraordinary amount of money being spent so soon," said Larry Weitzner, CEO of the GOP media-strategy firm Jamestown Associates. "It shows you how pitched the battle is and how intensely personal it has become for the NJEA and Senator Sweeney." Given the current ad blitz, spending by outside groups and the campaigns could reach $8 million, he said, putting the race on track to be among the most expensive in the history of New Jersey legislative campaigns. All 120 seats in the Democratic-controlled Legislature are up for election in November, as is the governor's mansion. "If it were a campaign for the U.S. Senate, then I wouldn't be surprised by this amount of spending in August," said Travis N. Ridout, a political science professor at Washington State University and director of the Wesleyan Media Project, which tracks all broadcast ads in federal and state elections. "But for a state Senate race, it does strike me as a bit early." "We tend to think a direct persuasive message — 'vote for this guy' — we tend to think those effects are fairly fleeting: a couple weeks, maybe a month," Ridout said. That's why advertising typically ramps up after Labor Day and reaches its peak right before Election Day. So why spend so much in the dead of summer? The pro-Sweeney super PAC wouldn't say, and a spokesman for Sweeney declined to comment. Super PACs can raise and spend unlimited amounts of money, but can't coordinate with campaigns. New Jerseyans for a Better Tomorrow — initially founded to support Sweeney's anticipated campaign for governor — had about $825,000 in the bank as of its June 27 filing with state campaign-finance regulators, while Sweeney's campaign had about $900,000 as of June 24. The NJEA said it was taking its message to television because the race was "hotly contested." "We are going to do what it takes to stay competitive," spokesman Steve Baker said. Sweeney, 58, vice president of the International Association of Bridge, Structural, Ornamental and Reinforcing Iron Workers, has represented the Third Legislative District in the state Senate since 2002, and was elected to his leadership post by his colleagues in 2009. He rose to power with the backing of his friend George E. Norcross III, the Democratic power broker and South Jersey hospital and insurance executive. The Senate president, in addition to the governor and Assembly speaker, is extraordinarily powerful; for example, he controls what legislation comes up for a vote. Sweeney's Republican opponent is Fran Grenier, 52, a supervisor at PSEG Nuclear LLC's Salem plant and a former councilman in Woodstown Borough, Salem County. Grenier had $2,835.35 in his campaign account as of late June, though he's expected to get funds from GOP leadership. But the bigger threat to Sweeney is the teachers' union, one of the most powerful interest groups in Trenton. Traditionally, organized labor has been a reliable ally to Democrats. But the teachers' union declared in March that it would seek to oust Sweeney from the Senate presidency, saying he had betrayed its members on issues such as school funding and public workers' pensions. 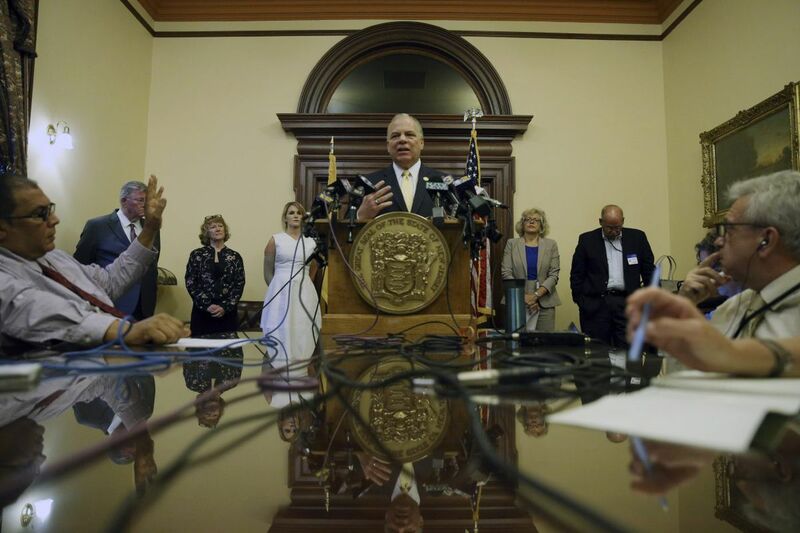 Most troubling, union leaders say, was Sweeney's refusal a year ago to hold a vote on a proposed constitutional amendment that would have mandated state funding for the pension system. Sweeney had previously supported the idea. On Tuesday, the union plans to hold a "Death of a Pension Amendment" rally outside its Woodbury office to observe the first "anniversary" of Sweeney's decision. The union is urging members to wear black and bring their families. "Steve Sweeney tries to tell you he gets things done for South Jersey. Don't believe him," says the narrator in one ad paid for by Garden State Forward, a tax-exempt group organized under Section 527 of the Internal Revenue Code, founded by the teachers' union. "Because Steve Sweeney gets things done for himself, for the special interests who pay for his campaigns, and definitely for Chris Christie. But Steve Sweeney doesn't get things done for you." Garden State Forward has also hit Sweeney with digital ads, and by sending mail to his constituents. The group reported raising $1.1 million from January through June 30, according to forms filed with the IRS. Of that, it had spent $521,000. Sweeney's allies are fighting back. In one ad, paid for by New Jerseyans for a Better Tomorrow, the narrator issues a "warning" to senior citizens in South Jersey, saying Grenier "continues to support Donald Trump despite Trump's health-care bill," and warns of premium hikes. Sweeney's Third District, which covers Salem and parts of Gloucester and Cumberland Counties, was one of two districts in the state represented by a Democrat that Trump carried last year. The group's latest ad shows a photo of Grenier with Christie as the narrator declares that Grenier's school-funding plan "could drive property taxes through the roof." Grenier says the attack ads prove that Sweeney is vulnerable: "When is the last time an incumbent Senate president was running ads on network TV in July, defending himself, anywhere in the United States?"